One Kiss has kept its place at Number 1 on the Official Singles Chart this week, setting a new personal best for Calvin Harris. The Dua Lipa-assisted track notches up a seventh week at the top, beating the six weeks that We Found Love with Rihanna spent at the summit in 2011. 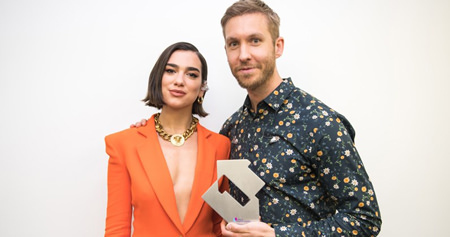 One Kiss finishes some 15,000 combined sales and streams ahead of its closest competition – Drake’s Nice What What at 2 – thanks in part to Dua’s performance of the song at the UEFA Champions League Final last weekend. Elsewhere in this week’s Top 5, Anne-Marie’s 2002 lifts from 4 to 3, Ariana Grande’s No Tears Left To Cry slips 3 to 4, and Jess Glynne climbs a spot to enter the Top 5 with I’ll Be There. Clean Bandit secure their ninth Top 10 single with Solo ft. Demi Lovato, which hops two places to Number 10. The track earns Demi her sixth top tier single, following last year’s Number 9-peaking Sorry Not Sorry. Two songs make advances into the Top 20 this week: Liam Payne & J Balvin’s Familiar lifts six places to Number 15, and George Ezra’s Shotgun zooms from 41 to 20. Both are strong contenders for this year’s song of the summer. US rapper A$AP Rocky claims this week’s highest new entry with Praise The Lord (Da Shine) at Number 29 following the release of his new album Testing, Drake lands his 36th UK Top 40 hit with I’m Upset at 37, and former N-Dubz star Dappy climbs five places to Number 39, marking his first Top 40 entry in six years. This entry was posted on Friday, June 1st, 2018 at 8:21 pm and is filed under Music News. You can follow any responses to this entry through the RSS 2.0 feed. Both comments and pings are currently closed.